If you need high-quality plastering for your commercial or domestic property, use our services. We can offer you the best interior and exterior plasterwork laying and creating of various plasterwork moulding in your home and commercial property. Your ceilings, walls and other surfaces can be plastered and repaired by our qualified plasterers. Our craftsmen can create beautiful plasterwork moulding for your home and business property. We offer creating of decorative plasterwork for interior and exterior rooms and buildings. Our services can offer your professional creating, restoration and renovating of different bespoke mouldings. They are provided in London seven days a week. If you need creating, implementation and restoring of plasterwork moulding, our craftsmen are on your disposal. They can cope with different plasterwork laying and restoration projects, no matter how complex they may be. 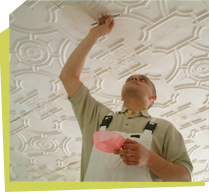 Whether you need creating or repair of outdoor, indoor plasterwork or mould making, use our services. The walls, ceilings and decorative fixtures in your home and commercial properties can be plastered with mouldings by customer’s choice. Our craftsmen can cope with creating the plasterwork mouldings you need in your property, with the exact design you want. If your ceiling or walls plasterwork has been damaged by moisture, fire, flood, or age, our plasterers can restore them to their original condition. They can create plasterwork mouldings with whatever design and style each customer wants. We can implement various bespoke and standard, modern and traditional plasterwork mouldings. If you need professional plastering of your walls, ceilings, interior and exterior surfaces in your home or commercial property, our craftsmen are on your disposal seven days in the week. They can repair and restore your existing slightly or considerably damaged plasterwork mouldings. We provide laying of plasterwork and repair services in London. They are affordable and done by qualified and skilled plasterers and craftsmen, working in our company. Call us and reserve the plastering and restoration of mouldings you need.